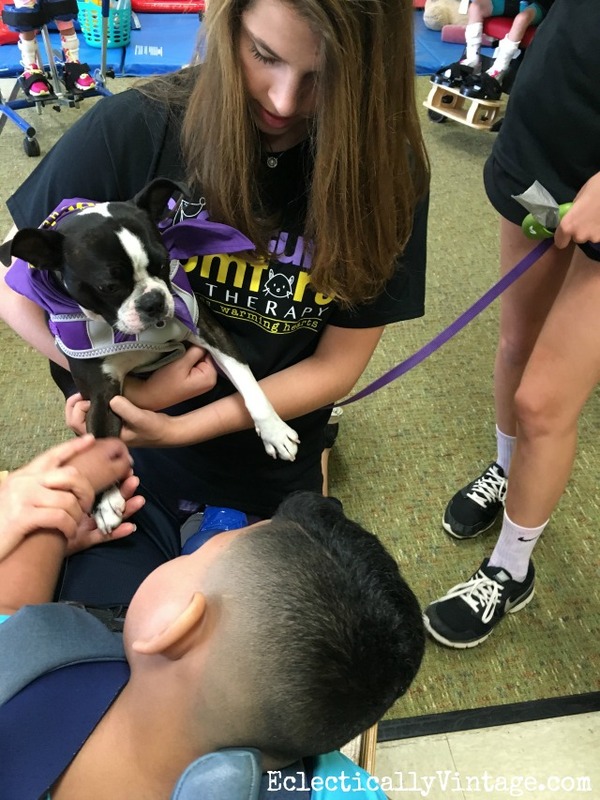 Sushi – The Pet Therapy Dog! She working that bandana like nobody’s business. 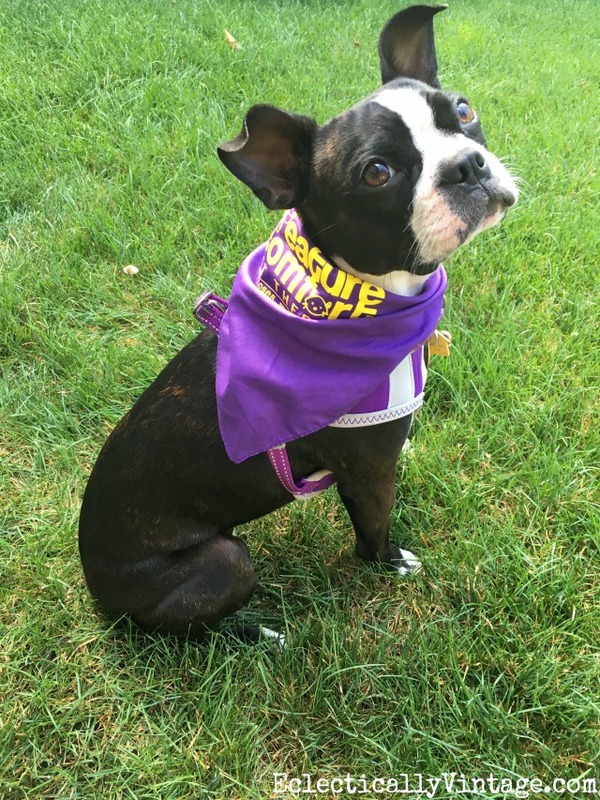 Yes, not only is Sushi the Boston Terrier the world’s cutest puppy but now she’s a therapy dog. She spreads joy and happiness wherever she goes. I’m so proud of my girls who trained our dog Sushi and passed a test so they could become a pet therapy team with Creature Comfort Pet Therapy. 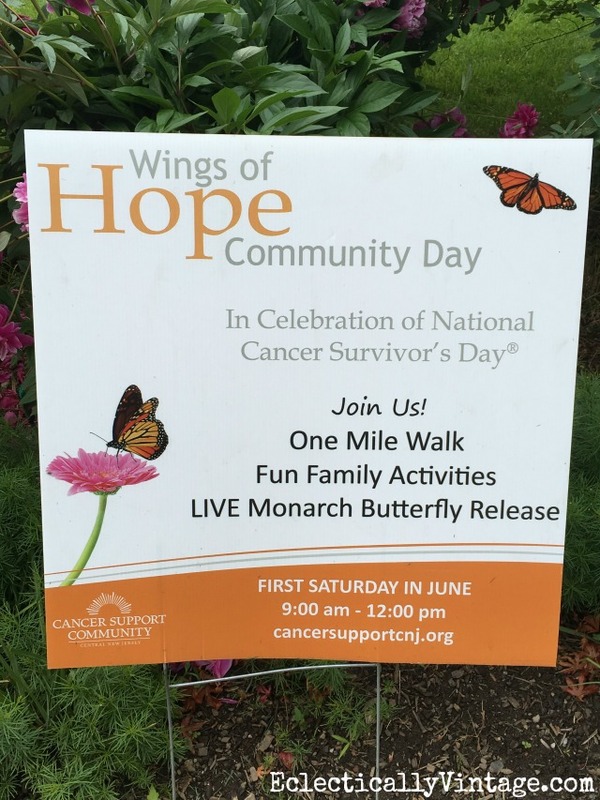 Their first outing was with a mentor team – an outdoor event for cancer survivors. Sushi provided lots of love and got lots of tummy rubs from everyone there. Sushi made friends – I think I hear wedding bells. After the girls and Sushi passed their mentor training, they were ready to go on their own. Off they went to First Children school where they went from classroom to classroom spreading joy and happiness (and lots of licks) to developmentally challenged kids. The kids were thrilled to see Sushi and so were the teachers! I am so unbelievably proud of my girls and welled up more than once watching them interact with the kids. 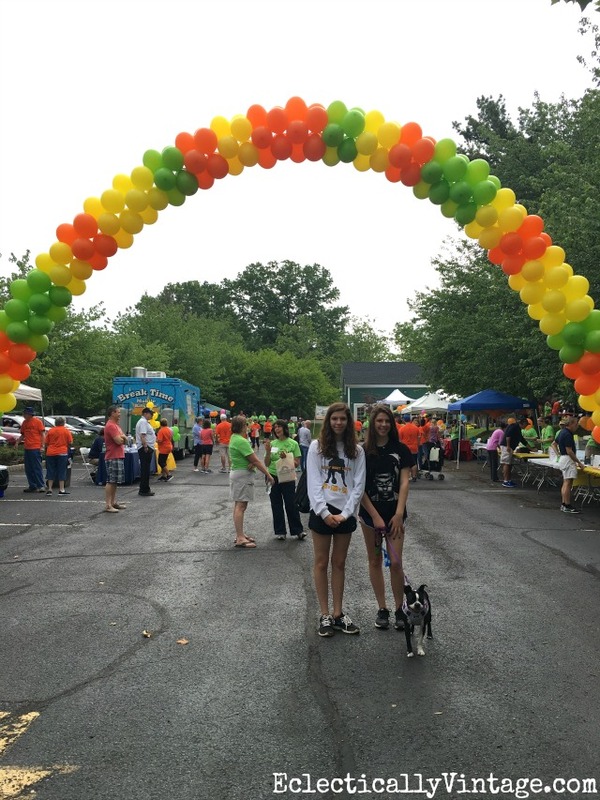 To provide caring volunteers dedicated to sharing their pet’s love by engaging people in a variety of community settings. To build connections between volunteers and facilities seeking animal assisted activities and therapy. 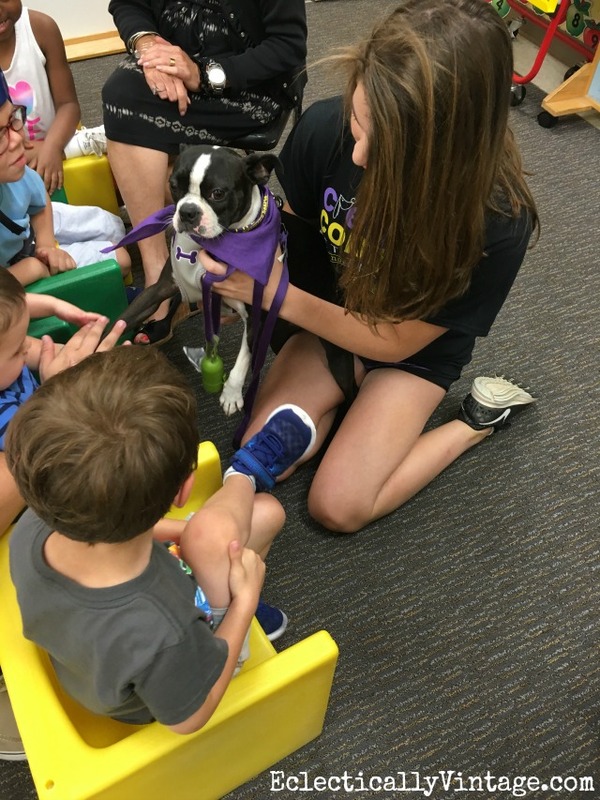 To increase awareness and provide education about the many benefits of pet therapy. If you have a loving, well mannered dog, my girls and I (and Sushi) encourage you to volunteer for pet therapy. It’s such a rewarding experience and Sushi loves it too! Sushi is exhausted and needs to rest up before her next pet therapy visit! 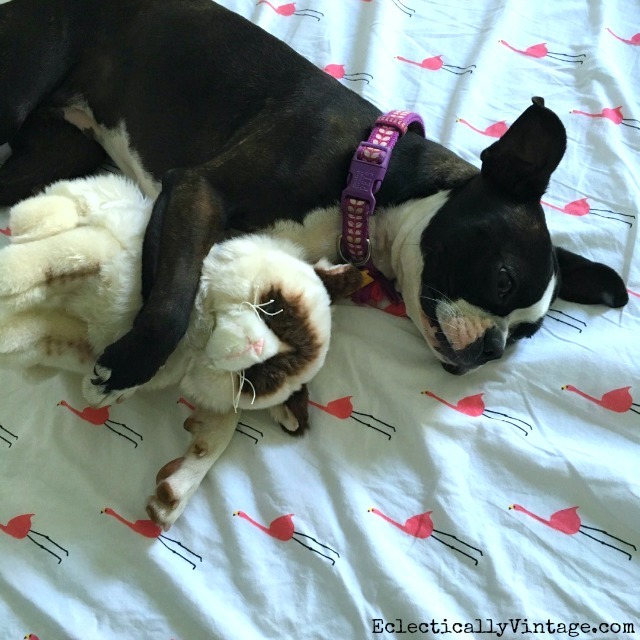 Follow Sushi The Boston Terrier on Instagram to see more of her shenanigans. Learn more about Creature Comfort Pet Therapy HERE. It really is Cassie – your dogs need to do this! This is so great, Kelly! You should be proud! Thanks Karah – Sushi wants to come to Aruba and spread her love. When she’s done with that, she wants to lay on a lounge chair with a pineapple filled cocktail while someone sprays her with Evian. This is awesome! And your girls are beautiful, inside AND out! One of my first dogs was a Boston, and she was the funniest, most energetic dog I ever had. So I really enjoy your Sushi snaps! Thanks for sharing this! Aren’t Bostons the most adorable dogs on the planet! Sushi is so fun, cute and sweet. She is the total puppy package! I’m glad you got to experience a Boston too! My husband was in two different hospitals in two different cities. 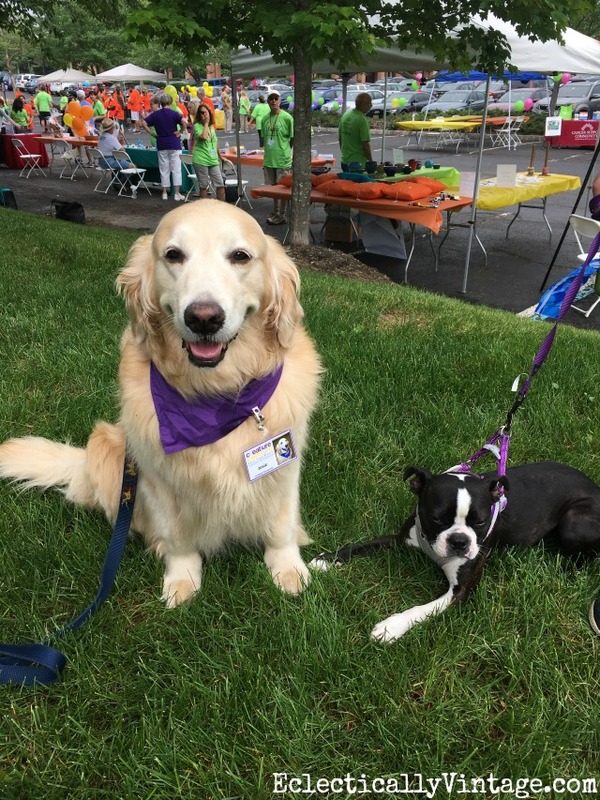 Both hospitals had people that volunteered and brought their pets in as therapy dogs. I cannot tell you how much better he felt after he had visited with the dogs. He missed our two so much that he was just thrilled that someone took the time to come and visit. Please keep up the good work and thank you. I’m so glad your husband found happiness in those dogs Patty. It is really amazing how much comfort pets can bring to someone who is suffering or out of their comfort zone. How cute and how proud you must be with all three of the children! Yes, my three daughters are amazing!!!! You have two wonderful daughters. We are never sure if what we teach them is sinking in and then they do something so amazing we know they will make it just fine. Sushi did a great job too!! Thank you Marlene – my girls love it and it always help break the ice when you have an adorable dog with you! Congratulations! What a great thing to do! I’m a puppy raiser for Guide Dogs for the Blind. My pet dog is a “career-changed” guide dog puppy that I raised. (He was too scent-distracted to graduate as a guide dog.) I’ve considered having him certified sometime in the future. I don’t have the time now, but will definitely keep it in mind! Our neighbor has a blind dog “career-changed” dog and she is the cutest, sweetest thing! That is so awesome that your girls trained Sushi for pet therapy! Sushi is adorable and probably really loves having such a special job. I did pet therapy years ago with one of my Shih Tzus. It was such a rewarding experience! I know how proud you are of your daughters. What a wonderful gift they are brining to the world. Thanks so much Sandy – it’s such a great thing for my girls – not to mention how much Sushi enjoys all the attention! 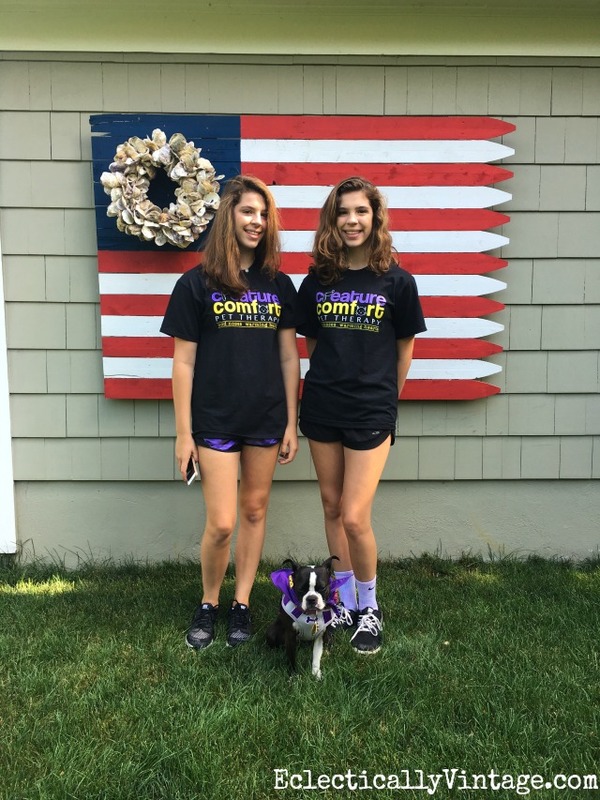 Congrats to the girls and their wonder dog Sushi!….They are the cutest! Such a great thing … I am sure Sushi will comfort all those in need of love and comfort! Thanks Shirley – if you ever feel down or blue, Sushi is your girl! Glad pet therapy is spreading – it’s such a worthwhile thing to do! This is the 2nd dog she has trained and certified. She has been doing this for years. All the seniors always look forward to the visits. Sushi and my girls send their thanks and licks (well the licks are from Sushi only)! Sushi says thanks – she loves to give back to her fans! Sushi is so cute! I have a Cairn Terrier and he is adorable but I’m not so sure he would do well as a therapy dog because like most terriers he has a piercing bark when startled or anxious about something. Good luck with the pet therapy business! Sushi is a terrier but luckily she’s not much of a barker Janet! She does like to bark at the garbage men and her short little hairs on her back stands on end!